This is NOT your average wash and wax! 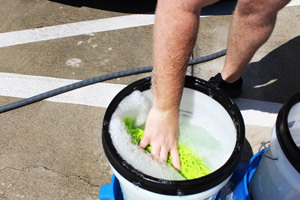 BLACKFIRE Wash & Wax is a two-in-one car washing formula that not only removes dirt, dust, road grime, and more from your vehicle’s surface, but also leaves behind a super-slick, hydrophobic layer of polymer-infused carnauba wax behind! Ideal for the professional detailer that specializes in quick-turnaround time, as well as the time-saving detailing enthusiast that longs for a clean finish, BLACKFIRE Wash & Wax allows you to (as the name tells you!) 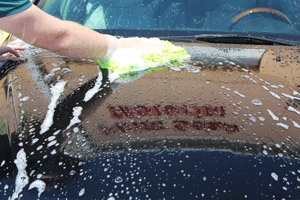 wash AND wax your vehicle at the same time! Safe for use on all surfaces, BLACKFIRE Wash & Wax rinses away freely leaving no splotches or streaking. 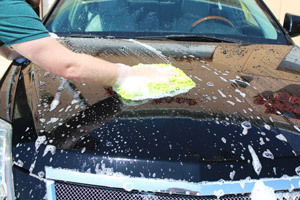 Boost your existing carnauba wax or paint sealant protection with weekly washes from BLACKFIRE Wash & Wax! When BLACKFIRE was re-introduced as a car care line catered to professional detailers, we just knew there would be a high-quality wash and wax in the new line-up – it just took them a while to find the right one! BLACKFIRE needed something with enhanced slickness to deter dirt and mud from taking up residence on your paint, as well as something that would create a deep, crystal shine. And don’t forget about longevity! But it’s finally happened – BLACKFIRE Wash & Wax! When you are detailing for profit, you want a product that will, 1. Save you money; 2. Perform well; and 3. Not take too much of your time! BLACKFIRE Wash & Wax’s advanced formula checks all of those boxes! Detailer’s Pro Tip: Mix 2 oz. 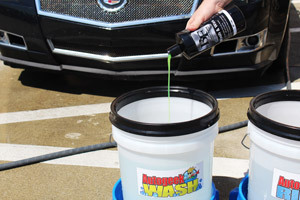 of BLACKFIRE Wash & Wax with half an ounce of BLACKFIRE Foam Booster and 6-8 ounces of water for use in a foam gun or foam cannon! BLACKFIRE Wash & Wax 32 oz.